Get a rapid and totally free estimate now. Just contact 020 3404 0500 or send us an online inquiry. All of our cleaners are coached and effectively prepared to deliver you with a safe and reliable hard floor cleaning service. They can get rid of scratches, stains and slippage from your personal hard floors. Any dull micro scratches, spots and watermarks will be removed, and the hard floor surface soiling. Based on your hard floor, the service can involve a professional vacuum, the use of cleaning spray, a professional scrub, rinse and dry cleaning procedure. 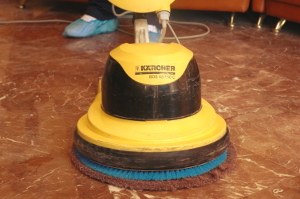 The cleaners will do a floor polish stripping, cleaning and buffing with the use of high quality modern technology, emulsification, heat, pressurized cleaning, and powerful capture of the waste. Once the floor surface has been expertly cleaned ongoing protection is achieved with an impregnator, seal and polish for protection. You indoor or outdoor hard floors will be rejuvenated and protected after we are done. We have been providing professional hard floor cleaning, jet washing, scrubbing, sealing, polishing, and also tile recoat and anti-slip protection service to the homes and businesses in the entire Putney SW15for more than ten years. Excellent Carpet Cleaning is popular for its top quality hard floor cleaning and polishing services. We have a growing number of clients who count on our domestic and commercial hard floor maintenance solutions. All of our cleaners are background checked, trained and experienced. We use only Prochem authorized cleaning solutions, which are absolutely safe for humans, animals and for the environment. Our cleaners will come with the professional cleaning solutions and tools to clean any type of hard floor outdoors or indoors. The floor is hoovered with a pro vacuum and checked out for any spots and other dirty parts. If there is polish or other sealing on the flooring, it is removed with the suitable instruments. The solutions are tried on a small spot before being used. The stains are pre-treated, and then a spray or other appropriate solution is used to clean it. Depending on the type of floor being cleansed, the cleaners may scrub, rinse and dry the floors. For some types of floors, modern technology is used for the heat, emulsification, pressurised cleaning, and helpful capture of the waste materials. Once the grout and floor surface have been professionally cleaned and on-going protection is achieved with an impregnator. Just call 020 3404 0500 or send us an online order below. Our customer care operators are there for you, so you will quickly be getting a written confirmation for the reservation. We can deliver same day service, but we are also out there every day. We need no downpayment for booking either. Our price ranges are fixed, with no hidden charges. We award customers who book more than one of our services at a time with very attractive discount rates. Those who book early on, regular clients, firms and landlords will get preferential rates for all of our services. Don’t wait - book our hard floor cleaning service and jet washing right now!